Gandert Daniel(2016),”A Change In Intent: The 2015 World Anti-Doping Code)”, in International Sports Law Review Pandektis (ISLR/Pandektis), Vol. 11: 3-4, 2016, pp, 307-318. Panagiotopoulos Dimitrios P. (2015) “Sport features as activities form individual actions of common sport distinction sport from “contests - competitions”: legal framework- interpretation -application”, International Sports Law Review Vol. 11, Issues 1-2, Pp.197-205. Peskov Anatoly2016),”Legal Regulation of the FIFA Confederations Cup 2017 and The World Cup 2018 (Legal and Criminological Problems)”, in International Sports Law Review Pandektis (ISLR/Pandektis), Vol. 11: 3-4, 2016, pp, 254-263. Ponkin Igor V., Ponkina Alena I. 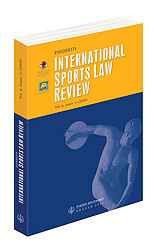 (2016),”Public Financial Support of Professional Sport )”, in International Sports Law Review Pandektis (ISLR/Pandektis), Vol. 11: 3-4, 2016, pp,.412-420. VOICU Alexandru Virgil (2016), ”Some Arguments Regarding the Necessity of Changing the Paradigm of Olympic Education In Agreement With an Adequate Juridical Pedagogy)”, in International Sports Law Review Pandektis (ISLR/Pandektis), Vol. 11: 3-4, 2016, pp, 388-397. Wang Xiaoping (2014), “ The Consideration On Revision Of Chinese Sports Law A Tentative Analysis On Proposals To Legislation Of Professional Sport”, in: International Sports Law Review Pandektis, Vol. 10:3-4, pp. Alexandrakis Vagelis (2012), “European Union And Sport: A New Beginning?”, in: International Sports Law Review Pandektis (ISLR/Pand), Vol. 9: 3-4, pp. 305-321. Argeris Stephen (2011), “Bonus Babies and Draft Dodging: Rethinking Baseball’s Antitrust Exemption through the Rule 4 Draft”, in: International Sports Law Review Pandektis (ISLR/Pand), Vol. 9: 1-2, pp.35-91. Bal Carczyk Justyna (2011), Protecting The Image of Adam Małysz, Robert Kubica and Jersey Dudek – The Polish Understanding of the Right to an Athlete’s Image in: International Sports Law Review Pandektis (ISLR/Pand), Vol. 9: 1-2, pp.22-34. Cavalier Georges (2011), “Taxation of Sports Business: An International and French Perspective”, in: International Sports Law Review Pandektis (ISLR/Pand), Vol. 9: 1-2, pp.13-21. Chen Hua-Rong (2012), “Sport: Based on the Constitution”, in: International Sports Law Review Pandektis (ISLR/Pand), Vol. 9: 3-4, pp. 267-275. Colantuoni Lucio (2011), “Intellectual Property Rights in Basket ball”, in: International Sports Law Review Pandektis (ISLR/Pand), Vol. 9: 1-2, pp. 139-166. Gentzsch Ricardo (2011), “Transfer of Adolescents in: International Sports Law Review Pandektis (ISLR/Pand), Vol. 9: 1-2, pp.109-130. Giandomenico Anna Di (2012), “Sports Fraud Minus Than Doping?” in: International Sports Law Review Pandektis (ISLR/Pand), Vol. 9: 3-4, pp. 287-298. Lindholm Johan (2011), “The Changing European Landscape of Anti-Doping Following the Lisbon Treaty”, in: International Sports Law Review Pandektis (ISLR/Pand), Vol. 9: 1-2, pp.92-108. Manarakis Sergios (2011), “Applying the Applicable Law the Ex AEQUO et Bono Provision of the Fat Rules”, in: International Sports Law Review Pandektis (ISLR/Pand), Vol. 9: 1-2, pp.174-190. Pachnanda Vikrant (2012), “The Importance of Arbitration in Sports the Court of Arbitration for Sport “The Emerging ‘Lex Sportiva’”: The Indian Perspective”, in: International Sports Law Review Pandektis (ISLR/Pand), Vol. 9: 3-4, pp. 259-266. Panagiotopoulos D. Panagiotis (2011), “The Opinion of the Fans for Sport Justice in Greece”, in: International Sports Law Review Pandektis (ISLR/Pand), Vol. 9: 1-2, pp.167-173. Papaloukas Marios-Daniel (2011), “Sports Image and the Law in: International Sports Law Review Pandektis (ISLR/Pand), Vol. 9: 1-2, pp.131-138. Peskov A. (2012), “Criminal Football Fanaticism, Criminological Analysis of the Problem in Russia and other Countries”, in: International Sports Law Review Pandektis (ISLR/Pand), Vol. 9: 3-4, pp. 276-286. Shulga Andriy, Zarakowski Marcin (2012), “Legislative Initiatives and their Implementation in the Context of Hosting the Final Tournament of the European Football Championship “Euro 2012”: Ukrainian And Polish Experience”, in: International Sports Law Review Pandektis (ISLR/Pand), Vol. 9: 3-4, pp. 299-304. Mohamadinejad Azadeh, Mirsafi an Hamidreza, Nemes András (2012), “Iranian Regulations Regarding Sports Accidents”, in: International Sports Law Review Pandektis (ISLR/Pand), Vol. 9: 3-4, pp. 353-361. Panagiotopoulos Dimitrios P., Patronis Angelos (2011), “Expulsion of A Basketball Club From the National League due to Transgression of the Greek Sports Law Provisions –Theoretical Review and Localization of the Consequences”, in: International Sports Law Review Pandektis (ISLR/Pand), Vol. 9: 1-2, pp.191-202. Panagiotopoulos Dimitrios P. (2012), “Sports Law, a Primitive Theory”, in: International Sports Law Review Pandektis (ISLR/Pand), Vol. 9: 3-4, pp. 256-258. Panagiotopoulos Dimitrios, Tzavela Maria (2012), “Athlete’s Ability to Negotiate A Mandatory Arbitration Clause in the Framework of An Entry Agreement”, in: International Sports Law Review Pandektis (ISLR/Pand), Vol. 9: 3-4, pp. 322-325. Papaloukas Marios-Daniel (2011), “The Legality of the Greek Sports Betting Monopoly under European Law”, in: International Sports Law Review Pandektis (ISLR/Pand), Vol. 9: 1-2, pp.203-208. Sebalo Achumanila & Akpata Dele (2012), “Risks and their Management in Sports Organizations in Botswana”, in: International Sports Law Review Pandektis (ISLR/Pand), Vol. 9: 3-4, pp. 339-352. Elli Sperdokli (2012), “Players’ Publicity Rights under USA Law “, in: International Sports Law Review Pandektis (ISLR/Pand), Vol. 9: 3-4, pp. 362-375. Voicu Alexandru Virgil (2012), “Matters Referring to the Legal Grounds of Sport Management in Romania”, in: International Sports Law Review Pandektis (ISLR/Pand), Vol. 9: 3-4, pp. 326-338. Panagiotopoulos Dimitrios P. (2011), « Kenteris and Thanou Case In Greek Penal Court”, in: International Sports Law Review Pandektis (ISLR/Pand), Vol. 9: 1-2, pp. 23-236. Panagiotopoulos Dimitrios P. (2012), “Report of Kenteris – Thanou Case Decision of Court of Appeal of Athens, 6-9-2011”, in: International Sports Law Review Pandektis (ISLR/Pand), Vol. 9: 3-4, pp. 408-409. Papaloukas Marios-Daniel (2011),”Commenting on the Ecj’s Markus Stoss Decision in: International Sports Law Review Pandektis (ISLR/Pand), Vol. 9: 1-2, pp. 236-238. Papaloukas Marios-Daniel (2012), “Political Considerations in the Sports Establishment. The appeal filed by the Curaçao Sport and Olympic Federation in order to be recognized as a NOC by the IOC fails”, in: International Sports Law Review Pandektis (ISLR/Pand), Vol. 9: 3-4, pp. 410-412. Papaloukas Marios-Daniel (2012), “Carmen Media Case C 46/08”, in: International Sports Law Review Pandektis (ISLR/Pand), Vol. 9: 3-4, pp. 400-403. Alexandrakis Vagelis (2010), “European Union and Sport: a New Beginning?”, in: I.S.L.R. Pandektis, Vol. 8:3-4, pp. 326-342. Alexandrakis Vagelis (2011), “European Commission Adopts the First Communicationon Sport”, in: I.S.LR/Pandektis, Vol. 8:3-4, pp. 462-464. Alexandrakis Vagelis (2009), “The Fight against Ambush Marketing and London2012: How has this phenomenon dealt with by the UK legislation and what’sthe role of the EU legislation?”, in: I.S.L.R. Pandektis, Vol. 8:1-2, pp. 156-166. Carvalho Maria José (2010), “Professional Sport in Portugal: An Overview ofIts Framework Law”, in: I.S.L.R. Pandektis, Vol. 8:3-4, pp. 361-374. Colantuoni Lucio, Novazio Cristiano (2010), “Betting on Sport”, in: I.S.L.R.Pandektis, Vol. 8:3-4, pp. 281-293. Colantuoni Lucio (2009), « Intellectual Property Rights, Licensing and Merchandisingin Sports. Comparative analysis USA-UK-Italy”, in: I.S.L.R. Pandektis,Vol. 8:1-2, pp. 16-45. Gradev Georgi (2010), “FIFA Players’ Agents Regulations and the RelatingJurisprudence of Fifa and the Court of Arbitration for Sport”, in: I.S.L.R. Pandektis,Vol. 8:3-4, pp. 311-318. Gradev Georgi (2010), “Sporting just cause and the relating jurisprudence ofFIFA and CAS”, in: I.S.L.R. Pandektis, Vol. 8:3-4, pp. 347-360. Heshka Jon (2009), “The Criminality of Doping in Sport”, in: I.S.L.R. Pandektis,Vol. 8:1-2, pp. 118-129. Laskaridis Emmanuel (2009), “The Compensation of A Doped Athlete”, in:I.S.L.R. Pandektis, Vol. 8:1-2, pp. 130-155. Lestón José Luis / Morte Ferrer Ricardo (2009), “Taxation of Sports Sponsorshipin Spain”, in: I.S.L.R. Pandektis, Vol. 8:1-2, pp. 11-15. Ma Hongjun (2009), “A Tentative Research on Chinese Sports Law of Post-Beijing Olympics Era”, in: I.S.L.R. Pandektis, Vol. 8:1-2, pp. 59-66. Nikolić Dušan (2009), “Convergence of Different Legal Cultures, GlobalizationOf Law And Lex Sportiva”, in: I.S.L.R. Pandektis, Vol. 8:1-2, pp. 67-83. Panagiotopoulos P. Dimitrios (2009), “Sports Law Foundation Sports Regulationsas Rules of Law- A Fundamental Institutional Approach”, in: I.S.L.R. Pandektis,Vol. 8:1-2, pp., 1-10. Panagiotopoulos P. Dimitrios (2010), “Remunerated and Professional Athlete’s Agreement,according to Greek Law”, in: I.S.L.R. Pandektis, Vol. 8:3-4, pp. 375-391. Panagiotopoulos P. Dimitrios, Mournianakis Ioannis, Alexandrakis Vagelis,Manarakis Sergios (2010), “Prospects for EU Action in the Field of Sportafter the Lisbon Treaty”, in: I.S.L.R. Pandektis, Vol. 8:3-4, pp. 301-310. Pereira Borges Maurício Ferrão, Aidar Carlos Miguel (2010), “Conflict of Norms in the Brazilian Legal System: Federal Constitution Vs. Civil Code”, in:I.S.L.R. Pandektis, Vol. 8:3-4, pp. 294-300. Petritsch Georg (2009), “Wada’s “Whereabouts System” – Athletes’ Price toPay? An Abstract of the Latest Developments”, in: I.S.L.R. Pandektis, Vol. 8:1-2,pp. 91-117. Shevchenko Olga (2010), Termination of Labor Contract with Sportsman underRussian Law”, in: I.S.L.R. Pandektis, Vol. 8:3-4, pp. 343-346. Yeun Kee Young (2009), “The Unification and Harmonizing of the Asian SportLaw”, in: I.S.L.R. Pandektis, Vol. 8:1-2, pp. 46-58. Xiaoping Wang (2009), “The Construction and the Future of Arbitration forSport in China”, in: I.S.L.R. Pandektis, Vol. 8:1-2, pp. 84-90. Voicu Alexandru Virgil, Voicu Lt. Iosif Bogdan (2010), “Judicialising Sports in Romania”, in: I.S.L.R. Pandektis, Vol. 8:3-4, pp. 319-325. Brooks Brian (2007), “The business of sports in South Africa” in: I.S.L.R. Pandektis, Vol. 7:1-2, pp. 172-198.